Server Core « Jorge's Quest For Knowledge! With Windows Server 2008, Microsoft introduced Server Core into the Windows Server operating system, which is a new installation option. Summarized: Windows Server WITH a GUI is Full Server and Windows Server WITHOUT a GUI is Server Core. You could also call it "Windows without Windows" or "Windows Command Prompt". Server Core has limited support for GUIs. Because of that a lot of the stuff locally must be done through Command Line Tools already in the operating system or third-party (free) tools. A non-exhaustive list of command line tools in Server Core can be found here. Server Core is the perfect Windows Server option with the lowest attack surface you can imagine. Lots of the baggage that Full Server has is not available. If it is not available there’s not much left to attack. Although perfect in terms of security, admins may not feel that well because they do not always know all the required command line utilities with their options to do something on the server. A while ago, the Server Core Configurator was born which allowed an admin to use a GUI to do stuff locally on Server Core. The story about that tool can be found here. Unfortunately that tool is not available anymore to download. So, what are the options now? On codeplex you will find two versions of Windows Server Core Configurator. Version 1.1 can be used on Windows Server 2008 Server Core (x86 and x64) and on Windows Server 2008 R2 Server Core (x64 only) because it is based upon VB Script. Version 2.0 can only be used on Windows Server 2008 R2 Server Core (x64 only) because it leverages PowerShell. The required features are "NetFx-ServerCore Feature" and "PowerShell" and both are only available on the Server Core version of Windows Server 2008 R2. As soon as you start version 2.0 it checks for the required features. If those are not installed, then those will be installed. If you are using Server Core on Windows Server 2008 R2, I really suggest you use version 2.0 of the Windows Server Core Configurator. The GUI is amazing! Have a look at some screenshots for both versions. "Windows Server Core Configurator Version 1.1"
"Windows Server Core Configurator Version 2.0"
You probably already know it by now. If you don’t, where the heck have you been lately? 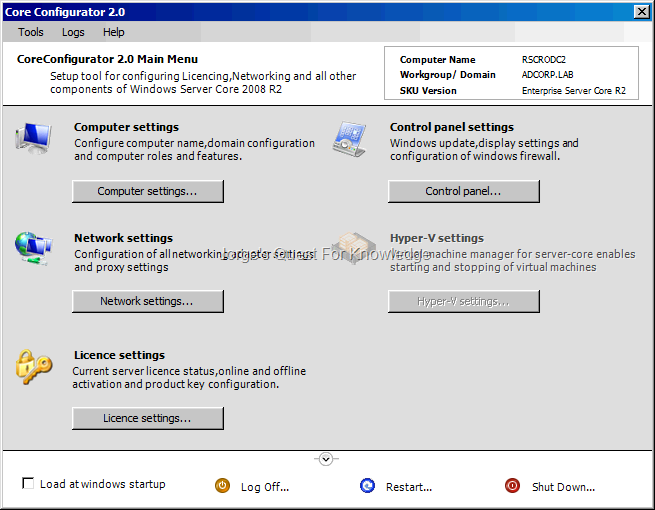 Windows Server 2008 provides two installation options. The first is Windows Server WITH a GUI (Full Server) and the second one is Windows Server WITHOUT a GUI (Server Core). Although it only shows a command prompt after logon, it supports very limited GUI functionality (e.g. NOTEPAD, REGEDIT, etc.). It could however be called "Windows without Windows". So, if you want to manage Server Core locally your knowledge of command line utilities must be quite good. If you want manage it remotely, you can use MMCs and WinRS. To summarize, these are notes I made once during beta test. Enjoy! REMARK: Make sure you go to the end of this post as it contains a reference to another very interesting post! Reduces servicing, management and hardware requirements and attack surface!!! Unattended install using a UNATTEND.XML file where it is possible to configure the "initial configuration tasks" and other settings (e.g. enabling TS, configuring screen resolution, enabling and configuring WinRM/WinRS) during unattended install. UNATTEND.XML file can be created with the "Windows System Image Manager"
Remotely via Terminal Server –> admin mode must be enabled first! Remotely via Windows Remote Shell –> remote management must be enabled first! Remotely via MMC –> watch out for the firewall on the server which is enabled by default! DCPROMO /UNATTEND /OPTION1:<value1> /OPTION2:<value2> /OPTION1:<value3> /OPTION1:<value3> …..
As you can see a lot of command line utilities. And this is not the complete list that is available. Besides that a lot of people were used to configure a Window Server through some GUI, but with Server Core you may need to use command line utilities like specified above. For some admins that can be a pain, especially if they are not used to use command line utilities. Like I said before in a previous blogpost, some people are crazy enough to create kick a$$ tooling for people to use that is even free to use. Regarding Server Core tooling, Guy Teverovsky, also a Windows Server –Directory Services MVP created a GUI that allows the configuration of basic stuff on a Server Core. Now how cool is that?!?!?! Trust me, it is damn cool! Enough blablabla, this Server Core tool can be found here.